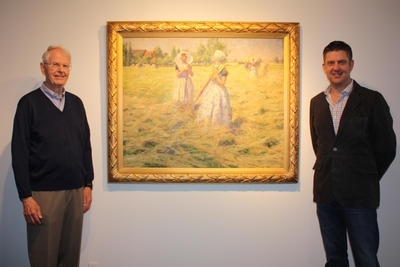 For ages, Joe Caldwell and his son Jay, principals of Caldwell Gallery Hudson, have been known in the trade as “the guys from Manlius,” a town near Syracuse in central New York State. But they are now ready to shed this identity and the art show circuit for a higher profile, storefront presence in Hudson. This is terrific news for art collectors living in, or traveling to, the Hudson Valley region. When asked how the Caldwells chose Hudson, Jay related how a friend traveling with them to a show in Winnetka, Ill., a few years ago spoke so glowingly of Hudson and that they had to come and observe for themselves. They certainly liked what they saw, appreciating Hudson’s arts and antiques community, location less than three hours north of New York City, and strong draw of art lovers not simply from the metropolitan area but from across the country. While this family-owned business may be grounded in the traditional values of handling high-quality art and providing high touch, discreet service to an international client base, Caldwell Gallery Hudson is not old-fashioned in the least. The Caldwells have rebranded the firm with a new graphic identity in keeping with Hudson’s contemporary vibe and have redesigned the interior of 355 Warren Street to create nearly 3,000 square feet of handsome and flexible exhibition space. They have also integrated electronic media into nearly every aspect of the business. Not only does Caldwell Gallery Hudson enjoy a very active presence on various social media platforms, but visitors to the gallery can use an interactive, wall-mounted tablet to gain access to the firm’s inventory database. They can even send copies of art works’ data sheets to their cell phones for future reference. “Panorama: 250 Years of American Art,” their debut exhibition celebrating the eclecticism of the Caldwells’ offerings, runs through October 13. As Jay noted, “we are not solely focused on one slice of the American art pie.” To demonstrate the range of works on view, he pointed to two canvases hanging side-by-side. The first was executed by colonial New York artist John Mare. Considered a self-portrait painted about 1765, it is rife with Masonic symbolism. Next to it we find Ukrainian-American Futurist David Burliuk’s “Memories of the Past” from 1947 with its nearly sculptural impasto surface, making for a provocative juxtaposition. Other artists represented in “Panorama” include Samuel Colman, A.B. Frost, Charles Courtney Curran, Guy Wiggins, Grant Wood, Isabel Bishop, Charles Sheeler, Kay Sage, Andrew Wyeth, Louise Nevelson, Harry Bertoia and many more.